In the summer before his senior year at Holy Ghost Preparatory School, Eric D’Angelo ’18 was working to envision the near future: how to prepare for his first year of college; what to study at the university level; the kind of career he might wish to pursue after earning his degree. His future gained clarity when he enrolled in a summer course in finance. Taught by Tom Murtaugh, chair of the social studies department, the course included lectures and class trips that provided hands-on opportunities to learn the inner workings of the financial world from leaders in the field, including Holy Ghost Prep alumni working on Wall Street. Some of the most impactful lessons he learned came through a key aspect of the class: the Frank Frederico ’00 Student Investment Fund. He and his classmates continued into AP economics in senior year and oversaw the fund as fiduciaries, meaning they did the investing and managed the money. 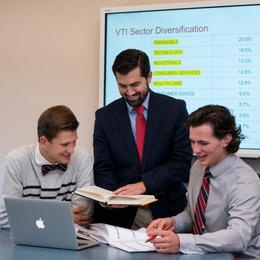 While some students may learn about the financial markets and investment strategies, this level of granular experience helped D’Angelo and his classmates develop a deeper level of understanding, according to Gregory J. Geruson, president of Holy Ghost Prep. Now in its third year, the fund was established through a $25,000 donation from Dominic Frederico, the president and CEO of Assured Guaranty Ltd., and the father of a Holy Ghost Prep alumnus. Led by D’Angelo, the Class of 2018 students who managed the fund earned a greater than 10 percent return on investment in a 10-month period, outpacing the S&P 500 prior to October’s market downturn. The students watch their investment choices carefully, helping them to compare the performance rates of different investment vehicles. Likewise, they get to learn how world events can affect the financial markets, according to Jack Rittenmeyer ’19, current president of the investment group that manages the fund. As for Eric D’Angelo, he’s now a freshman at the University of Pennsylvania in Philadelphia. His passion for finance and economics has only intensified since graduating from Holy Ghost Prep last spring.